The people in the GOP we are NOT hearing from today (in the wake of the Republican trouncing) are the social conservatives/Christian right. They are the anchor around the neck of the Republican Party, and they are ***INCAPABLE*** of moving one inch on their flagship issues of abortion and hating gays. Their leaders will not let them. Huckabee is talking about trying to get to Latinos, but it was WOMEN who drove Obama’s victory more than anyone else, and the Robertson crowd is never going to move off its position on abortion. It raises too much money for the televangelists and it’s too convenient a tool for whipping up fervor among low-education social conservatives. If it were just about their insistent fantasy of trying to return to the world of “Mad Men”, that would be a solvable problem for the GOP. But “Mad Men” is the Plutocrats’ fantasy and goal. The social conservatives’ fantasy is Jesusland, and tolerance is anathema for them. That’s the GOP’s real problem: they need all those ignorant Southern/Midwestern white Christians. They can’t get anywhere nearly enough votes without them. And they are an absolute stake in the ground which prevents the party from moving strategically. More election musing: the dispossessed. 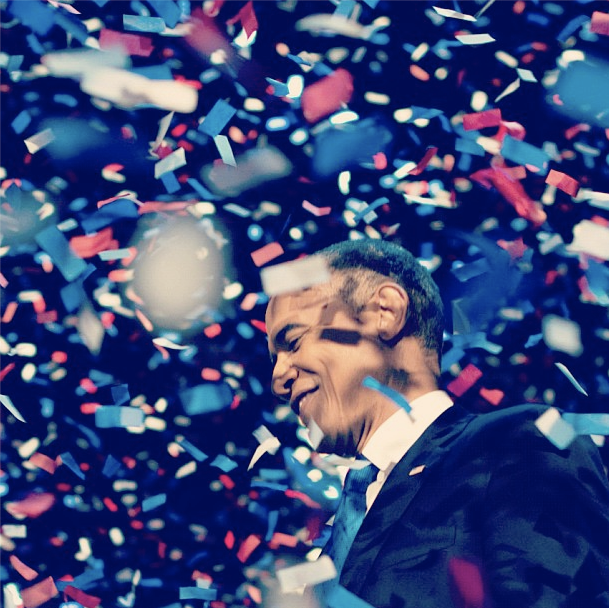 One of the remarkable things about Barack Obama’s first Presidential campaign was that he tossed the conventional wisdom about who would vote and who wouldn’t. He looked for groups of forgotten, ignored and untapped voters in places no one had looked for years: the young, for example. Low-propensity African-Americans and Latinos. He went to those constituencies, registered them, organized them and won. And then he did it again in 2012. One less-recognized part of that strategy was Team Obama’s major effort to register and turn out Native Americans. In low-population, high-Native states like NM and the Dakotas, Native American votes can be a deciding factor. And as it turns out, in North Dakota this time around, they were: they were the deciding margin that gave a Senate seat to Heidi Heitcamp over Rick Berg. Oh, and…that complete repudiation of the retrograde-fantasy, straight-white-male-rulership,hateful, antifactual, antidemocratic travesty that has become the brand and agenda of the Republican Party? I’ve been involved in FOUR elections that were decided by less than ten votes, from Sonoma City Council to an alderman race on Cape Cod. Anyone who tells you a vote doesn’t mean anything just isn’t informed. It means *everything*. Given the Republicans’ complete shellacking in this election, it does bear pointing out, friends, that the scary super-secret voting machine software patches owned and manipulated by Tagg Romney did not materialize. (Ohio Secretary of State Jon) Husted and the rest of the GOP tried everything they could this cycle to suppress the vote, because the system actually does deliver a result based on voter choices. Let’s try to remember that when the conspiracy theories start flying around next time. Here’s my take: the Powers want us not to care. It reinforces the narrative they’re trying to push: that nothing matters, that you can’t fight city hall, that the fix is in. They want us to go back to watching Jersey Shore and playing Angry Birds while they carve the world for their feast. But the truth is that we aren’t like that at all. We’re suckers for a dream: we’re Americans. We want to believe, and we will exert quixotic effort in the name of our belief. I know that I wouldn’t think twice if I had to stand in the rain for a couple of hours to vote–I’d wear a coat and chat with the next person in line, if I had to. But I wouldn’t consider not voting–not for one minute. I’m a shareholder in the future, goddamn it. My opinion matters. And so does yours. We aren’t the victims of history, nor its spectators. We MAKE history. We are its exponents. We COUNT, you and I.